CBTV and Globecast create new IP satellite transmission platform. Los Angeles, March 2018: Globecast has announced a technology partnership with Santa Barbara, CA-based CBTV for the launch of a groundbreaking new transport platform. This allows media, event producers and content providers to deliver streaming, file transfers, WiFi, 4K, 8K, and 360-degree live content using native IP-based satellite transmission from remote locations — moving beyond traditional broadcast formats and video workflows while creating advanced alternatives. The partnership between CBTV and Globecast provides high-availability bandwidth and highly efficient satellite capacity in areas where connectivity is limited, damaged, non-existent, or cost prohibitive. Customers can use the service for a variety of IP-based workflows including: high-bandwidth moving picture content; file transfers; communications redundancy; and IT services between remote sites and home locations — often reaching beyond existing infrastructure and facilities. 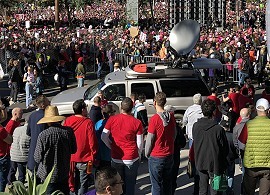 CBTV is a leading provider of news/special event remote connectivity via satellite, specializing in Internet protocol networked transmissions. CBTV has supplied RF/modem modulation, IP switching, and routing equipment to Globecast’s Culver City Media Center, forming a centralized media hub and worldwide backbone for customers using the platform.